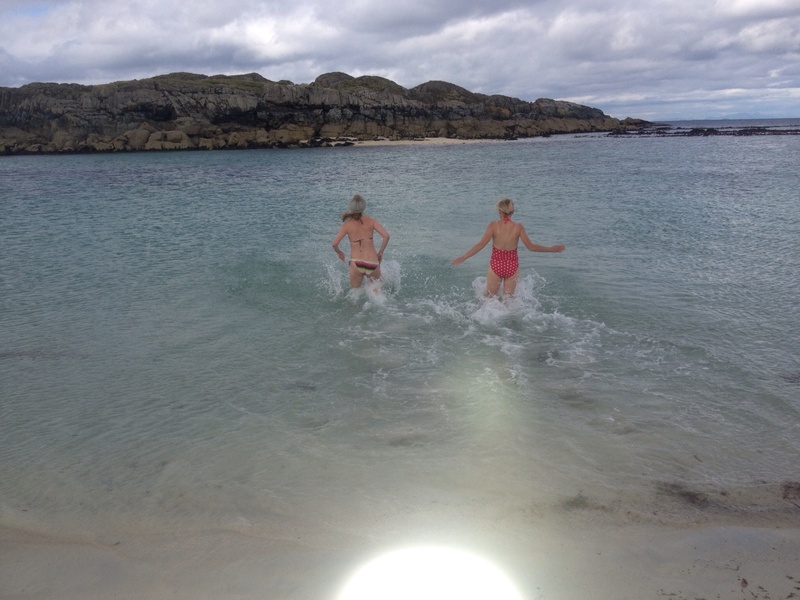 The monthly challenge for 2013 is simple………..a dip in any open water in the British Isles (at least to shoulders) without wearing a wetsuit or anything to keep you remotely warm. In the winter months, should be followed by a flask of tea and the warmest mountain socks owned. 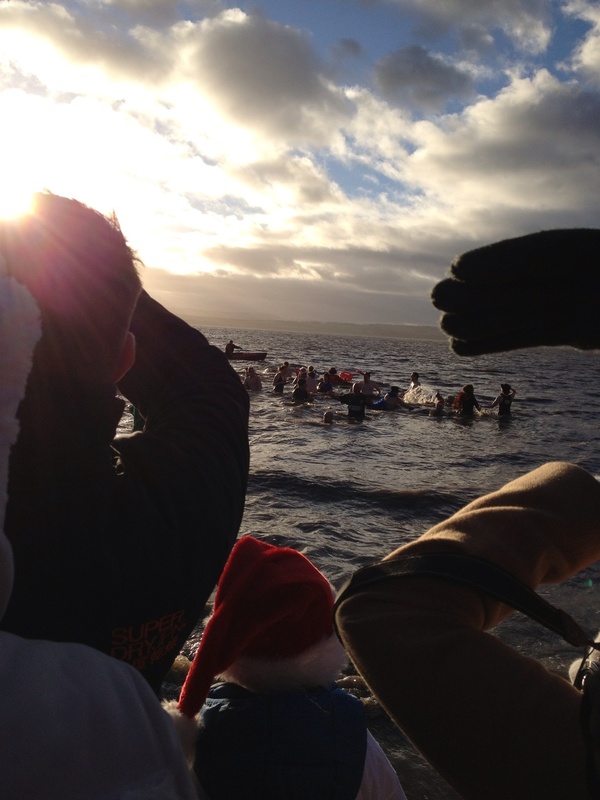 First off was the Limekilns Loony Dook. Set the tactics for the chilly months – stand in swim wear in cold easterly wind for at least 20 minutes. By then, your limbs have gone numb as your blood supply makes it way to your core and vital organs. By the time you go in the water, you feel positively warm! Great atmosphere and promise I’m somewhere in the photo! The shores of Loch Leven, Kinlochleven set the scene for February. 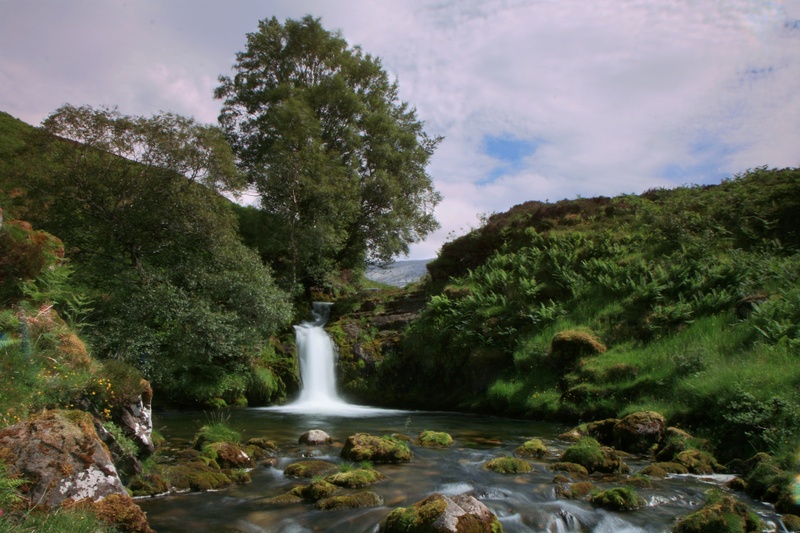 Had been at the Fort William Mountain Festival and really struggled to find water that was not frozen. This was a “this is it” moment as soon as we spotted the backdrop. Definitely looked a bit random to passers by as we stood on the beach aclimatising in bikinis but made the entry more pleasant. Foot was alarmingly blue when I came out but as I’m beginning to realise there is nothing like this to rejuvenate! Two weekends on the trot and same problem of finding water that wasn’t frozen. 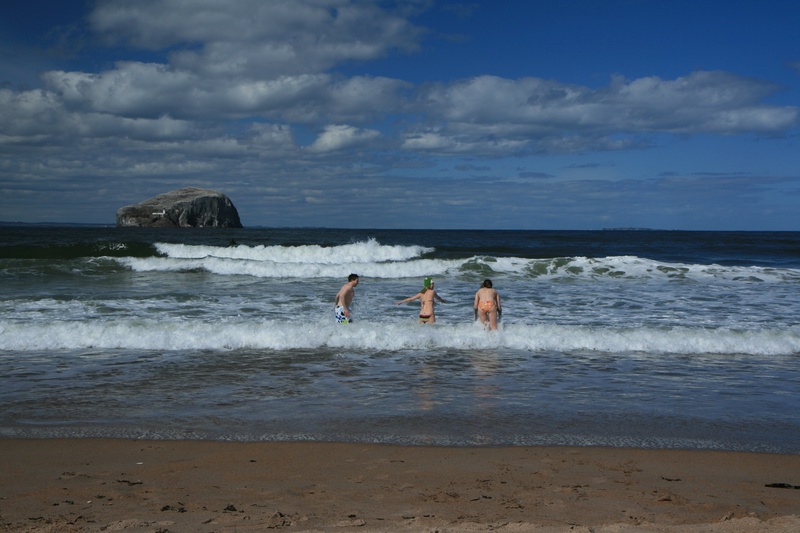 A great ‘final fling’ before surgery…..surfing Saturday morning at Belhaven followed by a gorgeous drive up to Glencoe. Camped at the Red Squirrel and had food and drinks in the Clachaig Inn. Ice climbing on Sunday and then the dip. Light was fading fast and we couldnt find any water! From the roadside it looked like Lochan na h-Achlaise was our last chance before dark. 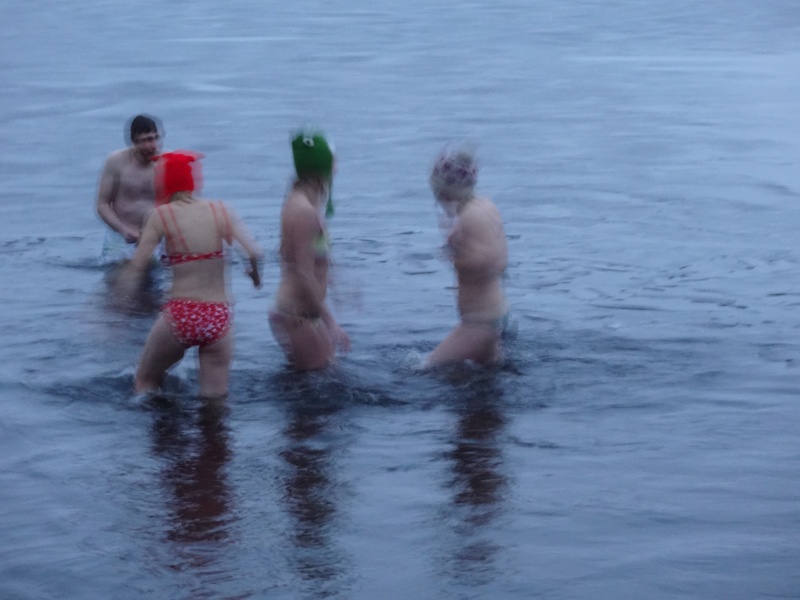 We park up, changed into our swimmers in the layby and trampled down towards the Loch only to realise it was frozen. Thankfully there was a small patch at the side which had melted so this was our entry point. Video to follow. Unfortunately the photo is a bit blurry – combination of darkness setting in and icy photographer hands. This month was always going to be a bit tricky after my hip surgery in March. With no wild weekends up north on the cards it was going to have to be fairly local, with vehicle access close to the water and a sandy entrance. I’ve always loved going to Seacliff from my surf kayaking days; there are no signs directing you from the main road and you head down a muddy single track to a beautiful bay. Bass Rock is in perfect view and if you head out to sea you catch the silhouette of Tantallon Castle perched about the seacliffs. I’d taken my crutches to avoid any slips in the water (last time I was wild swimming here a crab pinched my foot) and provide some support. The weather was glorious but there was a chilly bite to the air. 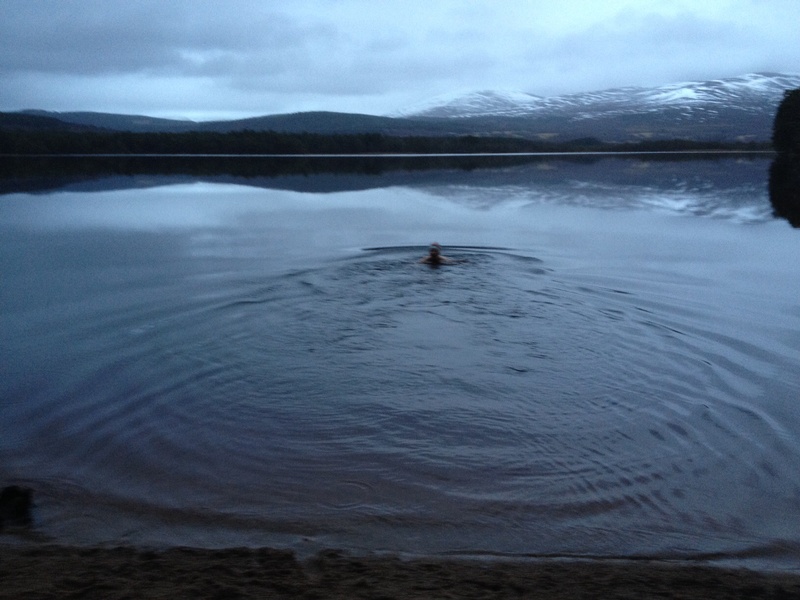 We’ve established our acclimatising routine by now but it didn’t quite prepare us……this felt like the chilliest dip so far, surprising given the last one was in a frozen loch! Biggest turnout of dippers yet. We headed south to a beautiful spot in the Borders; St Mary’s Loch. The woman in the Glen Cafe warned us of the cold temperatures of the loch with tales of people who had ‘turned the colour of a post box’ and were still sitting in their car warming up. Kirsten was up from Bristol with strict instructions to bring her bikini for the honour. Andy had recently had surgery for carpal tunnel so continued the post op theme and was sporting a nice plastic bag glove to protect his wound. It seems to be becoming the norm that after the buzz of the first dip we go back for seconds. Where did June go? Just managed to squeeze a dip in while away to Aviemore with friends from University. Loch an Eilein has always been a special place; family holidays in the area always involved a walk round the loch and it has special memories of our times with Auntie Elma. 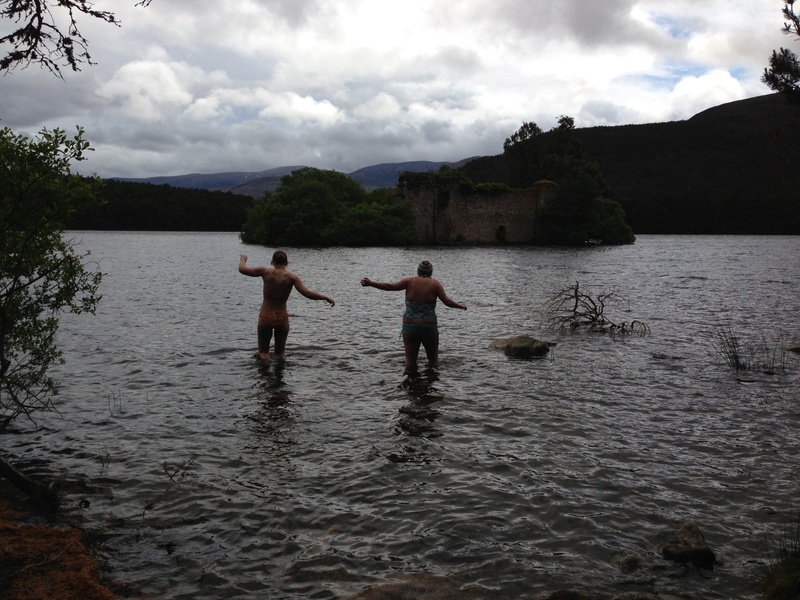 I managed to convince Morag to join me and this was the first dip that I actually managed to ‘swim’. My foot was still blue when I came out despite the water feeling warmer than before. I love the backdrop of the castle and Cairngorms. A few years ago when I was up for New Year the loch was frozen and we walked out to explore the castle ruins. That was a truly magical experience. We were based in Achiltibuie for the week and went for a walk up to the Bone Caves near Inchnadamph. 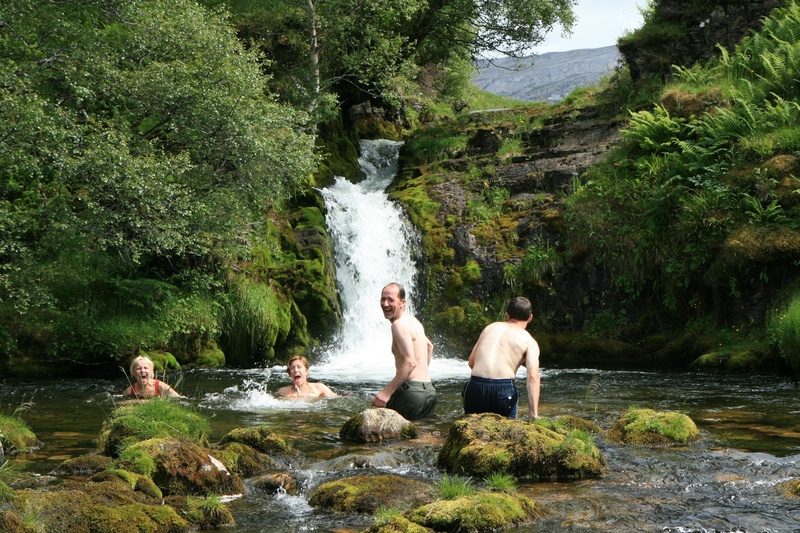 It was a gorgeous day and the water pools on Allt nan Uamh proved irresistible. Ian was the first to take the plunge and the rest followed. Despite it being pretty warm, the water was very refreshing (ie freezing). After a tentative dip, it wasn’t long before Andy led the way with jumping into the pools. Somehow jumping in and your head going under was easier than trying to navigate the rocks underfoot and slowly wading in. 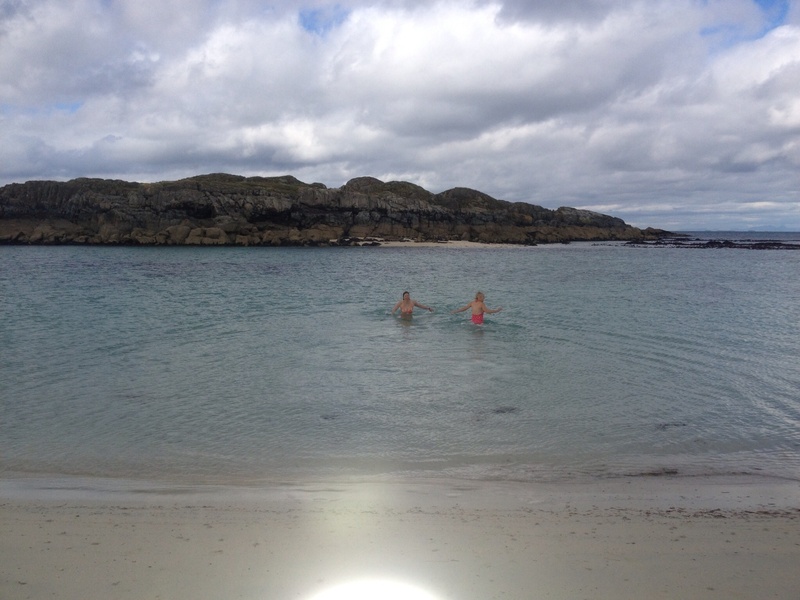 Iona was the perfect setting for the September dip. After escaping the blue rinse brigade when we got off the ferry we made our way to the north of the island. I was keen to swim over to a beautiful strip of sand on Eilean Annraidh but there was a pretty strong current in between. After a wetsuit swim over to and round the back of Eilean Chalbha I got the others from their pebble (Tracy) and rubbish from the dump (Julie) scavenging missions for the no wetsuit dip. It was a lovely bit of sand nestled amongst some lava rocks with crystal clear water ahead. Managed a few head submersions and Julie had to do it twice so we could get photo evidence of us all in the water. Once again a really invigorating way to spend a Sunday. I ended up doing a second dip later on while out for a sunset paddle in the packraft. The water looked too good not to jump in in my pants and t-shirt. Unfortunately it led to a rather extreme midgie attack! 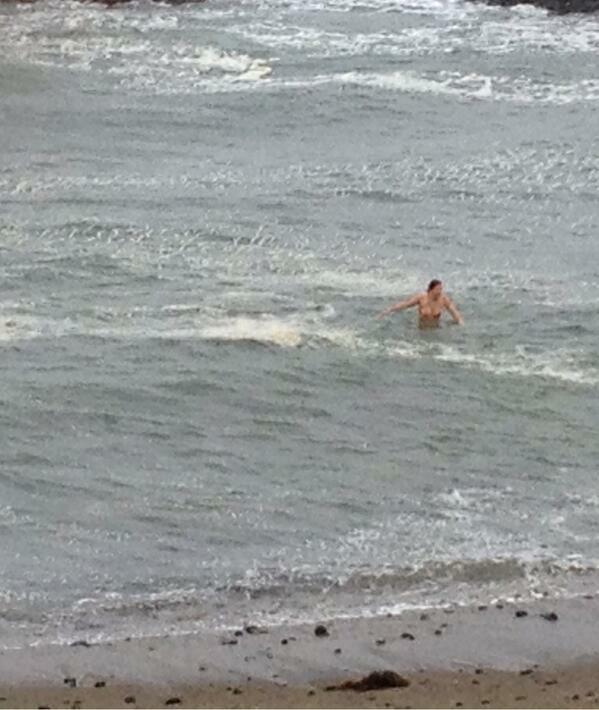 After a failed attempt in the Lake District, the October dip fell to the Moray coast. Spent the day working along the coast taking photos before stumbling across Sandend Bay. The car next to us were getting wetsuits and hoods on for surfing as I got changed into my bikini, wrapped a towel round me and headed for the waters edge. Seemed a bit weird being on the periphery of the surfers as I charged through the waves for a full submersion but thankfully not as cold as I’d thought. Some new inductees for the November dip as a plan was hatched at someone’s leaving do from work. We had a great day up Ben Chonzie with loads of snow and brilliant panoramic views of the glistening slopes of Ben Lawyers, Schiehallion and the Tarmachan Ridge. We walked alongside Loch Turret reservoir which looked quite inviting as the mid morning sun struck on route to the summit. It wasn’t quite the same story as we approached from the west side after a long day on the hill. Weary legged and a chill in the air, I thought there was going to be some change of hearts as the dip beckoned. Good effort from most though as we waded in, wearing a variety of outfits from bikini to underwear to full clothes. First one in a while that it took a wee while to warm up but still worth it!